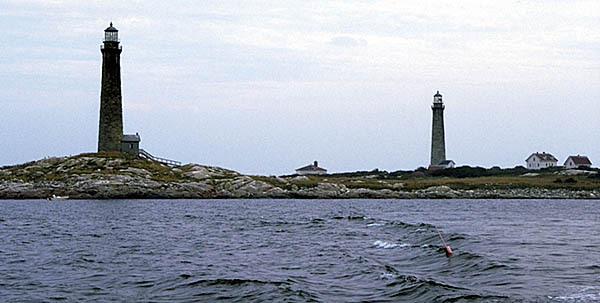 The twin lights of Cape Ann were the last of the 11 Colonial era lights. 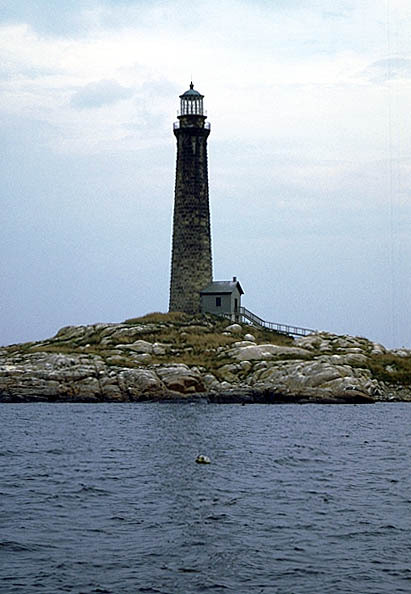 The original towers were 45 feet tall, and were replaced in 1861 by the current 124 foot towers built with blocks cut from the granite quaries around Rockport. Both towers originally had first-order fresnel lenses, but today only the south tower is active, with a revolving airport beacon. The north tower was taken out of service in 1932. One bit of Thacher Island lore has it that in 1919 President Wilson was returning from Europe aboard the S.S. America. The ship was in a heavy fog and bearing down on Thatcher Island, when at the last moment disaster was averted by the station's fog signal. 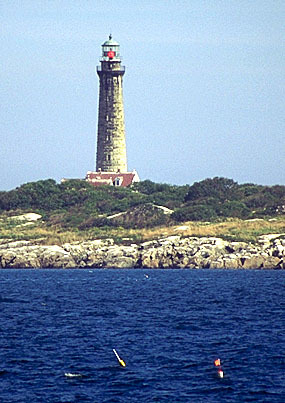 Thacher Island can be seen up close by catching a tour boat from the T wharf in Rockport.